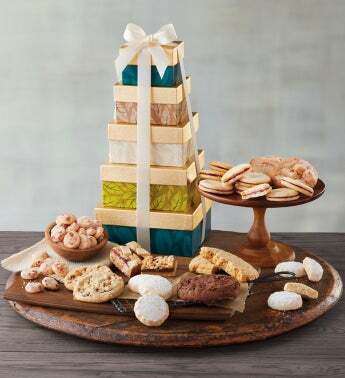 Delight friends and loved ones with a tower brimming with delectable cookies fresh from our bakery. The assortment includes buttery lemon raspberry button cookies, indulgent chocolate chocolate chunk cookies, irresistible raspberry galettes, a rich peanut butter cookie bar, and plenty more to share. The goodies are packed in elegant boxes topped with a hand-tied bow.